Last spring, Michigan Tech began a new era of Huskies hockey with the hiring of Mel Pearson as the 21st head coach in the program’s history. If May 2011 was highlighted by philosophical changes to the program, then May 2012 will certainly be remembered for physical changes. Earlier in the month, the replacement of the John MacInnes Student Ice Arena’s 40-year-old ice plant began. The $1.3 million project will replace pretty much everything located in the first foot under the ice sheet. The Huskies announced another physical change to the hockey program, but this one will reside above the surface of the ice. Michigan Tech unveiled the first of three new hockey jersey designs that will be debuted during the 2012–13 season, the last for the current configuration of the WCHA. The new look of the Huskies will serve as an on-ice reminder of the pending changes that will follow next season with the departure of eight current league members and the addition of at least five new teams. Much like the new WCHA to come, the jersey design is a fresh look for the on-ice Huskies. Based on a rendering released by Michigan Tech University that contained front and back views of the jersey concept, it is clear that the team is taking some styling cues from the NHL. Gone is the square cut style “sweater” that was the norm in North American hockey for decades. Gone are the horizontal stripes along the bottom hem. Gone are the fancy (and rather expensive) three-color sewn twill “kiss-cut” numbers and names. Even the long-standing “Huskies” script cresting and “piano keys” dog head logo failed to make the cut for this jersey design. What is “in” starts with the new cut of the jersey. Similar in style to those used by most top professional leagues today, the jersey is based on what has become known as the Edge cut with a tighter fit in the arms and chest along with tuxedo like tails in the rear and a subtle curve to the cut in the front. The name Edge is a reference to the Edge 1.0 and Edge 2.0 jerseys which debuted in the NHL during the 2007–08 season. 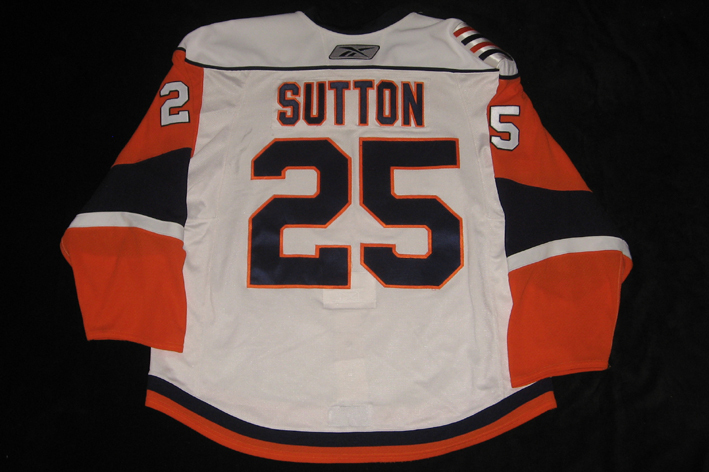 (See examples of former Huskies defenseman Andy Sutton from the 2007–08 New York Islanders and forward Chris Conner from the 2007–08 Dallas Stars.) The shape may be more than a coincidence as a source within the program has stated that the new jerseys will be supplied by Reebok, although early sets will not contain any exterior identification of the manufacturer. While no physical example of the jersey has yet been seen, the rendering seems to indicate that the front of the jersey will be a solid material, while the under-arm and back area will be a more breathable, open type of material. Again only an assumption at this point, but the lettering and numbers will likely be sewn twill which is typical of Reebok designs and has been the standard of Michigan Tech jerseys of the past. The rendering indicates a single color will be used, and player names will be placed on solid nameplates for ease of changes and replacement. geography of Michigan last graced a Tech jersey in the late 1980s in celebration of Michigan’s 1987 sesquicentennial. The player’s right shoulder will carry the official university seal. 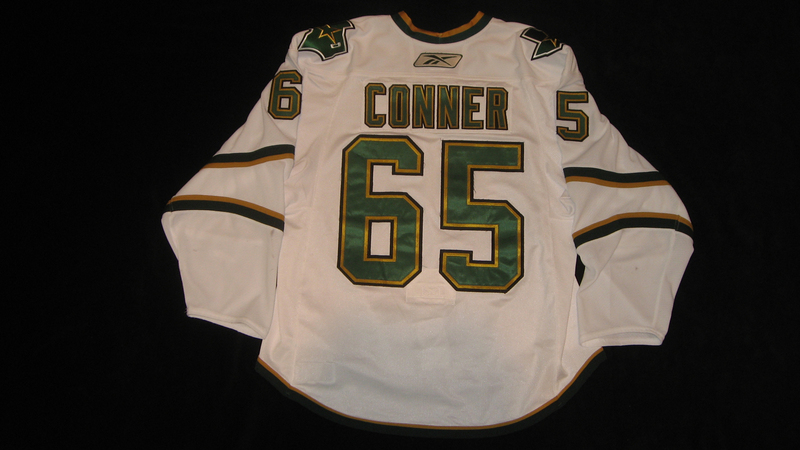 This is a popular trend with many Eastern hockey programs, however some early reviews of the jersey design questioned the inclusion of the seal as its use on apparel is forbidden by university identity standards. In the opinion of the author, a well-constructed, multi-color embroidered patch of the official seal and the addition of a star or other mark highlighting Houghton’s location on the opposite shoulder are not only acceptable, but items which add a touch of class to the overall design. Coach Pearson commented on the shoulder highlights by saying, “We wanted to include the shoulder patches to honor the tradition and long-standing history of the University and our location in the Copper Country.” The back of the player’s neck will carry a second smaller reference to the school name with a block “MICHIGAN TECH” above the player’s name. It is likely that the WCHA logo will also be added to the right chest of the jerseys as well. Overall, early reviews from fans have been positive and now the countdown to the release of the next design in June can begin. Ryan graduated from Michigan Tech just before the turn of the century (BSME 1998). After many years in the Huskies Pep Band drumline, Ryan eventually found his way to Denver, CO where he is currently a sales engineer in the construction industry. When not busy adding to his collection of 700+ collegiate and professional game-worn hockey jerseys, he serves as a road game photographer for Tech Hockey Guide, as well as contributing the occasional off-beat editorial piece.